The South Burnett's live regional daily events calendar! 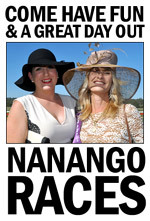 The Nanango Race Club will be holding their annual Nanango Cup Race Meeting at the Lee Park Raceway off the D'Aguilar Highway just south of Nanango from 11:00am to around 5:00pm today. Today's races will have a "Elegant Black and Ravishing Red" fashion theme and everyone is encouraged to dress up in their most stylish outfits and/or accessories to be in the running for some great Moffatdale Ridge Fashions Of The Field spot prizes. The race club's popular [email protected] Bar will be serving up platters all day if you fancy a bite; a licensed bar and BBQ will be operating under the extended covered area; the race club canteen will be open for sit-down dining; and there'll be plenty of bookmakers and an on-course tote available in the betting ring to take your wagers. This meeting patrons can also enjoy two mini-grandstands that will be erected on the grounds - but if it rains there's heaps of undercover seating too! A lot of people like to use the Nanango Cup race meeting for relaxed get-togethers, and you're welcome to picnic on the lawns or even bring your own marquee if you like. This will be a 7 race meeting and buses will be running to the races from Kingaroy's Glendon Street Bus Depot (12:00 noon) and Nanango's Fitzroy Hotel at 12:30pm. The first race will leave the barriers around 12:45pm but gates will open at 11:00am so go-getters can get a head start on that all-important socialising. Admission is just $10 for adults and $5 for pensioners (under-15s are free). Everyone is welcome! More details? Phone Rosemary on (07) 4163-2346 or email her. Yes! It's on again and more mind-snapping than ever! The 25th Annual Kumbia Brain Drain will be held at Kumbia Hall on the Bunya Highway in Kumbia from 6:00pm until late this evening. The event - which is the major annual fundraiser for Kumbia State School P&C - is a trivia-style tournament where teams of 6 compete for great cash prizes. Guests at this year's Brain Drain are encouraged to dress to the theme "'Straya – 1993 to 2018" to be in the running for great prizes for the best-dressed dinki-di team and best team name. There'll also be cash prizes for round winners and overall winners, along with the usual fun-filled audience participation games and raffles. Traditional Aussie snacks, tea and coffee will be provided, but you'll need to BYO liquids if you have a righteous thirst that needs specialised attention. Admission is $120 per table of six, players must be aged 15 years and over, and a maximum of 35 teams can take part. There'll also be a bus running from Kingaroy to Kumbia, but you'll need to book to reserve a place. More details? Phone Kate 0407-262-262. Note: The Brain Drain is usually sold out, but any tickets still available can be booked online. The Nanango Show Society will be holding their regular monthly Country Markets at the Nanango Showgrounds in Cairns Street from 6:00am to around 12:00 noon today. As usual, the markets will feature a wide variety of craft stalls, new and used goods, plants, poultry and pets. The Nanango Markets are the largest rural market in south east Queensland and attract up to 420 stallholders. But new stallholders are always very welcome too! More info? Phone the Market Co-Ordinator on (0427) 631-273 during business hours. Nanango Scouts will be holding a Garage Sale at their Scout Den at 40 Henry Street from 6:00am to noon today. This is an important fundraiser for the troop and will feature all sorts of household items, antiques, bric-a-brac etc. Stalls can be booked for $10. For more information, contact Ceinwen on 0430-110-634. Photographer Nadine Gray will be holding a free digitial SLR camera workshop at the Wondai Regional Art Gallery on the roundabout at Wondai from 1:00pm to 5:00pm today. The workshop will cover learning how to use the features of your camera in manual mode (eg: exposure, shutter speed, ISO, aperture etc) and is limited to 8 people. Participants should bring their DSLR camera, their camera manual, a pen or pencil and a cup or mug (tea and coffee will be provided). You can book a place or find out more by phoning Nadine on 0417-823-387. The monthly Kennel Jam Session will be held at the Hivesville Hotel in Main Street, Hivesville from 5:00pm until late tonight. All musicians young and old are welcomed at these sessions, and so are all music genres. All the necessary backline gear is provided, too - just bring along your guitar, your voice and your friends and enjoy a great night of music. Accommodation is available at special rates for music lovers on the night, there's free camping nearby, and dinner will be served from 6:00pm to 8:00pm. The Murgon Mustangs will be hosting a mini-carnival from 9:00am today at Murgon Showgrounds, featuring U6s, U8s and U10s from Murgon, Kingaroy, Central Burnett and Wondai. At 12:05pm, Murgon U12s will take the field against Wondai; followed by U14s at 1:00pm (Murgon v Wondai); U16s at 2:00pm (Murgon v Kingaroy) and A Grade at 3:15pm (Murgon v Wondai). Meanwhile - at Stags Park in Nanango - the Cherbourg Hornets will be taking on the Stags: 9:00am U6s, 10:00am U8s, 11:00am U10s, Noon U12s, 1:00pm U14s (Nanango V Kingaroy), 2:00pm U16s (Nanango v Chinchilla) and 3:30pm A Grade Cherbourg v Nanango. Canteens will be operating at both grounds and the bar will open for the senior games. The annual BVRT E2E Challenge - a 165km cycling race over the full length of the Brisbane Valley Rail Trail between Wulkuraka and Yarraman - will be running from 6:00am to 6:00pm today. And after the recent completion of the BVRT's "missing link" between Toogoolawah and Moore, this will be the first year this gruelling race has been run entirely on the Trail. The BVRT E2E is a race for serious cyclists (who'll be in the running for prizes) and those cyclists who just want to test their fitness (they'll be in the running for a feeling of elation if they can manage to complete the course). More details and ticket bookings can be made online. The Murgon RSL Sub-Branch will be holding a special meeting in the Diggers Room of the Murgon Services Club in Lamb Street at 10:00am this morning. The purpose of the meeting is to nominate additional office bearers, and all members are urged to attend. The Proston Car Rally Club will be holding their quarterly CAMS Khanacross Multiclub Rally at their racing track this weekend (the club's track is located 7.5km west of Proston on the Proston-Boondooma Road). Racing will commence around 11:00am this morning and conclude around 2:00pm tomorrow. There'll also be burnouts from around 5:30pm tonight. Up to 50 cars attend Proston Rally Club meetings from all over Queensland and NSW and spectators are very welcome. There'll be a BBQ and soft drinks stand running throughout the event, as well as a hearty breakfast supplied by the Proston Lions club early on Sunday morning. Hot showers, toilets and free camping are available on site too. Admission to the Rally is 100% free for spectators, $50 for adult participants and $25 for juniors. More details? Phone 0458-689-446. AFL fans who want to watch a home game should head to Lyle Vidler Oval next to Beangrowers in Youngman Street, Kingaroy at 2:30pm this afternoon, where the South Burnett Saints men's team will be playing Coolaroo in their annual Heritage round (the women's team have a bye this weekend). The Heritage round salutes the former Kingaroy Bulldogs, the first AFL team in the area. A bar and canteen will be operating in the grounds and spectators are very welcome! The Yarraman Bowls Club in Margaret Street, Yarraman will be holding their weekly Men's Lawn Bowls games from 9:30am this morning. New players are always welcome. More details from the club: (07) 4163-8269. The 15th round of this year's local football competition will be played in Wondai and Kingaroy today - the last round before the all-important 4-week finals series. In Wondai, home team Barambah will play Wests at the Wondai Soccer Fields north of the Wondai Sportsgrounds, with the Women's Division hitting the park at 1:00pm, followed by the Men's Division at 3:00pm. And in Kingaroy, home team Gunners will play Nanango's Panthers at Tom Alford Oval at the end of Oliver Bond Street, with the Women's Division sides playing at 4:00pm and the Men's Division playing at 6:00pm under lights. A canteen will be running at both venues and spectators are very welcome. Meanwhile, junior soccer games will be played at the Wondai soccer fields this morning. The Wondai parkrun group will be holding their weekly 5km timed run at Coronation Park in Wondai at 7:00am this morning. Runners follow a course along the South Burnett Rail Trail and the parkrun group is free to join. All you need to do is register (once) online at parkrun.com.au and bring the printed barcode to any parkrun event. More details? Send an email. Sistas In Sync will be holding a brunch at South Burnett Ministries (Church in the Marketplace) on the Bunya Highway in Kingaroy at 9:30am this morning. Women attending the brunch should bring along a plate of food to share and a few dollars for coffee from the café. All women are welcome, and can bring along a friend or two as well if they wish. Noosaville's Outbike Australia will be running a South Burnett Rail Trail Day Trip for cyclists today. The day trip will pick up participants at Noosa, Noosaville and Gympie and will offer three options: an easy ride from Kingaroy to Murgon (45km sealed); a hard ride from Murgon to Kilkivan (45km unsealed); and an extreme 90km ride from Kingaroy to Kilkivan. Bus fares are $120 return from Noosa, and bikes can be hired for $20 if you don't have your own. South Burnett locals are also welcome to take part, and there's $40 rider and bike transfers from Kilkivan to Kingaroy available if you need help getting back home. More details? Phone Outbike on 0406-440-418. A dance will be held at Inverlaw Hall on the Burrandowan Road (roughly 20km from Kingaroy) from 8:00pm until late this evening. Music will be supplied by Diamonds and there'll be the usual great supper and novelties, along with a Lucky Door draw. Admission fees are $10.00 for adults, $5.00 for high school students and everyone is welcome! More details? Phone June on (07) 4162-1195 or David on 0459-228-882. The Murgon Men's Shed will be holding a meeting at their shed in Macalister Street, Murgon (the former Murgon Railway Station) today. The Men's Shed meets every Wednesday, Thursday and Saturday to work on projects and new members are always welcome. Popular South Burnett band Mr Q will be headlining a Blue Party at the Palace Hotel in Drayton Street, Nanango from from 7:00pm to 11:00pm tonight to help kick off the hotel's UGLY Bartender fundraising campaign for the Leukaemia Foundation. As the name suggests, guests should wear blue and be prepared for a lot of fun! Everyone is welcome and admission is free. More details from the hotel on (07) 4163-1287. The Proston Men's Shed will be meeting at the old railway station building at Railway Park in Rodney Street, Proston for its regular Saturday get-together today, kicking off with a cuppa around 9:00am and running until noon. New members are always welcome. More details? Phone Geoff on 0439-694-000. Kingaroy's Commercial Hotel at the corner of Glendon and Haly Streets will be holding a Thrift Shop Retro Theme Party in The Nest from 9:00pm to 1:00am tonight. For $15, you can dress up in thrift shop and/or retro clothing and get access to the pre-party that will run from 9:00pm to 10:00pm along with a wrist band that will get you VIP service at the bar and tasty treats (after 10:00pm entry is free, but you don't get the bonuses). Music for this closed-door, VIP event will be provided by DJ iLLP and DJ Direx, who'll be mixing it up all night. More details? Phone the hotel on (07) 4162-1380. The Maidenwell Hotel will be holding an Aussie Tucker Night from 6:00pm to 9:00pm this evening that includes hot damper served with your meal, prawn specials, and a choice of sticky date pudding or pavlova for dessert, along with live music. More details? Phone the hotel on (07) 4164-6133. Popular local entertainer David Lynch will be performing live in the front bar of the Kingaroy Hotel-Motel at the corner of Youngman and Haly Streets from 8:00pm until late tonight. Admission is free. More details from the hotel on (07) 4162-1677. Popular entertainers Smooth & Groove will be performing at the Kingaroy RSL in Markwell Street, Kingaroy from 7:00pm until 11:00pm tonight. Admission is free. More details from the RSL on (07) 4162-1755.